IT must create an intelligent data strategy that not only efficiently and securely stores data, but also pre-positions the data for real-time or future application use. Understanding application and location requirements – speed and continuity of access, proximity to the compute node etc. – really means understanding the business processes and applications the data strategy must support. Alongside the data deluge the other great commonplace of IT commentary is that ‘IT must get closer to the business’. Nowhere is this truer than in data strategy. By understanding the applications – often built around analytics or AI – which drive competitive advantage, and the ways in which those applications may move towards the edge, IT can build a data strategy which directly impacts business success. Intel believes that a successful modern data strategy is software-defined, based on application requirements and intelligently tiered. This paper is going to focus on data tiering, and Intel Optane technology’s place in that process. Understand current application data requirements: What is the relationship between data and the applications that use it. How is the data consumed? What are the latency and availability requirements? Who needs access and how? Which applications are business-critical? Project future data requirements: Which future applications will make challenging data demands – either performance, location or cost? What will be the effect of the long-term business plan on data requirements? Create a data hierarchy: Data lives everywhere, both inside and outside an organization. Most application strategies will require varied types of data, and as such it is important to understand the relationships between the various databases, both structured and unstructured. Modeling the data provides a hierarchy across an organization and is often a success factor in the execution of an analytics strategy. 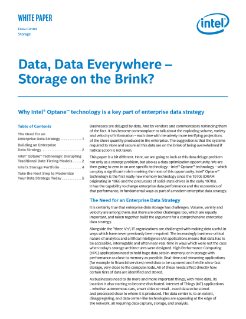 Consider enterprise-level impactors: A data strategy that is driven by business objectives will need to address a myriad of factors that will impact both the storage environment and analytics strategies. These include such things as data availability, data privacy, data retention, and compliance with data-centric regulations that the enterprise may need to conform to, data sourcing, and data cleanliness. At the end of this process enterprises should have a 3D picture of their current and future data hierarchies, and the ability to start tiering them. Most IT departments think of data in terms of temperature. ‘Cold’ data is almost never accessed but needs to be securely stored. At the other end of the scale, ‘hot’ data needs to be frequently and rapidly accessed. And, of course, data needs to be able to move through the tiers according to application and security needs. Enterprises need to address the data challenges of the future with a clear vision of their application and architectural needs, and how data fits in, then develop a clear roadmap to deliver the storage modernization which will support that strategy. The alternative is choking on data growth, escalating costs and missed business opportunities. Intel is leading the storage revolution with new technologies that change how data storage looks and functions. Watch how the SteadyServ iKeg* measures supply and delivers real-time analytics from the cloud. Learn about key trends in IT transformation, and see how you should be thinking about IT infrastructure modernization. What Is Intel® Optane™ Technology?